The devil incarnate main title male protagonist and his trusty general. 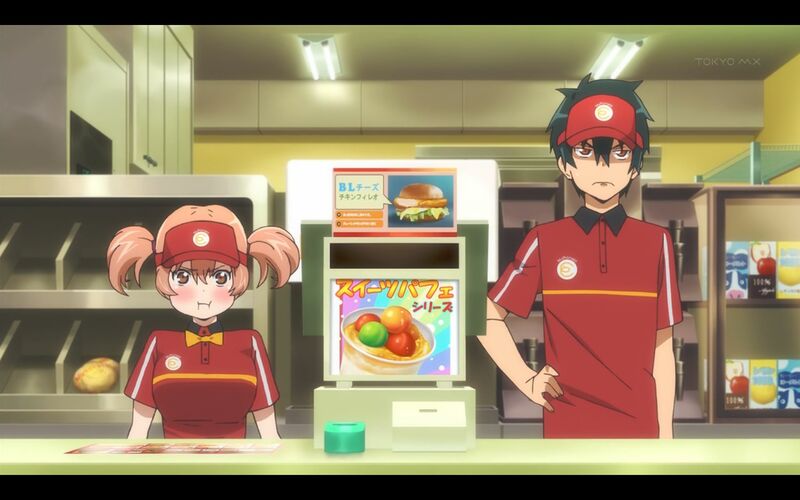 The third anime I decided to review in this blog ‘ Anime of the Year 2013’ audition today is the a series with an awesome ANN-transliterated English name – The Devil is a Part Timer!. Usually I will just use its usual Japanese title ‘Hataraku Maou-sama’ but when I visit this anime’s ANN page, I know straight away I have to use their title for this anime’s review instead. Name-wise, this anime far surpassed the first two titles reviewed here before in this audition, both in awesomeness and length, but does its story actually managed to repeat that feat? The essence of the anime's storyline. In a distant fantastical world in a galaxy far far away from Earth called Ente Isla, the local demon lord a.k.a. the main male title protagonist is just about to finish subjugating the whole world but was thwarted by the heroic main female protagonist and her merry band of heroes. Deeply wounded, the demon lord and one of his trusty generals enter hyperspace and escape to an alternative world commonly known here as Earth. Naturally, the righteous heroine followed suit to finish the job, but she instead found out that she has just landed in a hell on Earth called Japan and was finished by the demon lord, then condemned as a slave at NTT DoCoMo. After disposing his mortal enemy, the demon lord now has his sight fixed on a new enemy: Kentucky Fried Chicken. As far as the quality of this anime’s story goes, it gravitates more upon the level of the second anime reviewed in the audition (Mondaiji-tachi ga Isekai kara Kuru Sou Desu yo? ), rather than the first one (Yahari Ore no Seishun Love Come wa Machigatteiru). 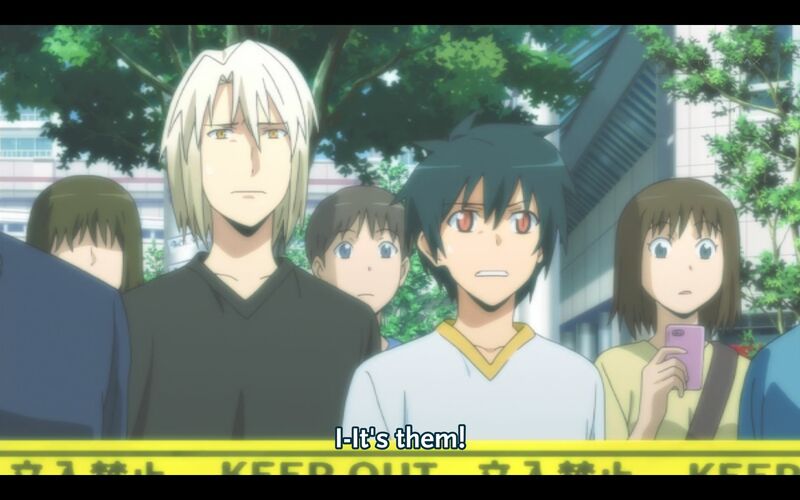 And this has nothing to do with the former’s penchant for alternative worlds, just like this anime does. This anime starts very well, unlike the two previous anime reviewed in the audition before; even better than Mondaiji-tachi ga Isekai kara Kuru Sou Desu yo?. But when the big war against KFC across the street started, the plot’s quality started to trod downhill from there. This inability to keep the quality of the storyline up or constant is what set this anime part from its two predecessors in the audition, negatively. At least those two doesn’t regress the way this anime does. The main title male protagonist has decent character strength, but is nowhere as good as his counterpart is in Yahari Ore no Seishun Love Come wa Machigatteiru. The latter is way too good though, the former shouldn’t be ashamed for losing to him. The main title male protagonist is better at least than his counterpart in Mondaiji-tachi ga Isekai kara Kuru Sou Desu yo?, which is a good thing because the main female protagonist isn’t good enough to become a foil for him. The main female protagonist weakness in characterization is so apparent, it makes me wonder why the demon lord loses to her at Ente Isla in the first place. 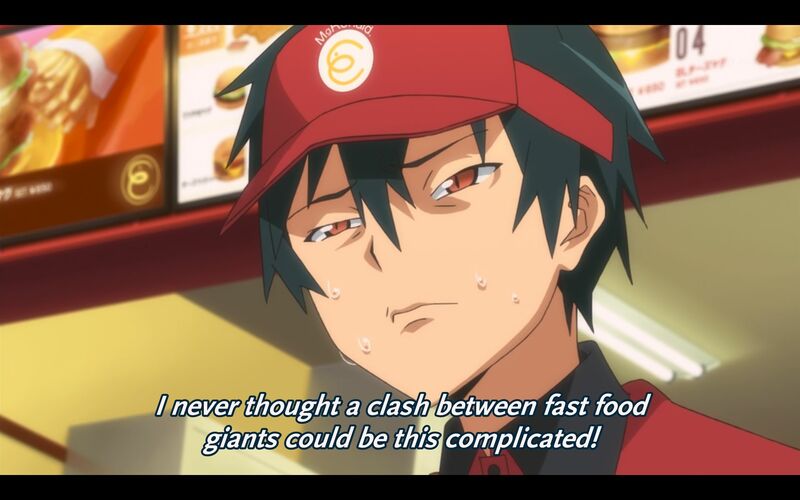 The main male protagonist is definitely the best character of the show; only that he is no Hikigaya Hachiman. The storyline’s pacing is good, even in the regressive second half of this anime. The flow of the storyline is peachy too. While it is obvious that there are more to come from this anime story-wise (two more generals hasn’t made their appearances, and also who is Miki-T and why everyone seems to ignore her), this anime doesn’t manage to make me interested on what its future may hold, which is the opposite of what I have felt for the first two titles in the audition. The ending (this anime ends at the penultimate episode) is good and not as abrupt as the Mondaiji-tachi ga Isekai kara Kuru Sou Desu yo? ending. yet still opens the possibility of a second season which ahs not been announced yet in the time of writing. The devil incarnate main title male protagonist and his surly queen. In this anime that takes place in modern Japan, black hairs is surprisingly rare, mainly because most of the characters with high amount of airtime is not from Earth. The ones that are real Japanese doesn’t happen to have them either. In general, character designs in this anime is pretty much ordinary, just like in Yahari Ore no Seishun Love Come wa Machigatteiru. Or Mondaiji-tachi ga Isekai kara Kuru Sou Desu yo? for the matter. 3 straight titles where their characters all have cookie-cutter shounen designs means the industry has not improved on this aspect for 3 years now? Not a dialogue-heavy title unlike Yahari Ore no Seishun Love Come wa Machigatteiru, this anime is the worst so far when it comes to voice acting quality. Basically, unlike the other two anime titles reviewed here before in the audition, voice acting gigs in this anime is just average. Uninspiring voice acting gig for the main male protagonist is the hallmark of this anime and the one for the main female protagonist is even worse. Lucifer’s voice actor is really good though, and so is the permanently-stoned female companion of the heroine from Ente Isla. Other characters’ voice acting quality lies between those two extremes. The soundtrack for this anime is good. 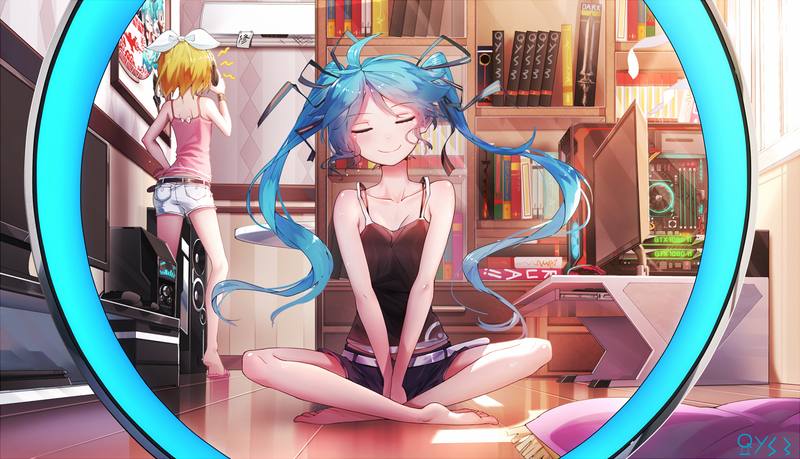 Not as good as soundtrack of Mondaiji-tachi ga Isekai kara Kuru Sou Desu yo? though, but at least good enough not to be dinged by me. This anime’s OP theme is actually decent too, unlike the first two anime in the audition that has failures for their OP/ED themes. Only the ED theme is a little bit meh. The overall animation quality in this anime is good and flawless. Integration between CGI and traditional animation is smooth. Choreography in action scenes in this action anime title are really mediocre though, you are definitely not going to watch this for the fights. This anime has the best directing gigs so far in the audition, mainly because there are no notable mistakes that his counterparts in the two anime titles reviewed before this one has committed. If there anything else I can say about the director, I’ll say there isn’t any. A positive aspect for this anime. 7 out of 10. Same score as Mondaiji-tachi ga Isekai kara Kuru Sou Desu yo?, therefore Yahari Ore no Seishun Love Come wa Machigatteiru is still ahead in this audition for this blog’s ‘Anime of the Year 2013’ title. If EveTaku fan-sub group finished subbing the episode 14-16 of the final season of Oreno Imouto ga Konnani Kawaii Wake ga Nai before I decided to continue the audition, then it will be next anime reviewed here. Else, it will be the one after the next one.